A significant work has been published in march 2014! 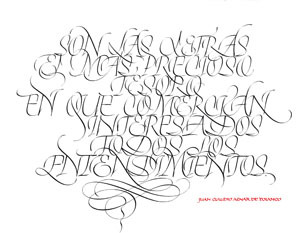 It has taken seven years of deep thought and intensive work to create the 300 original pieces of calligraphy especially for this unique book. 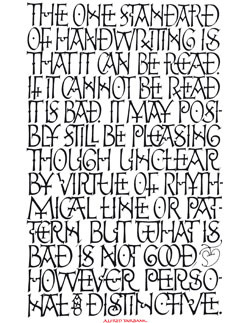 Written in eight languages, the texts essentially consist of quotes from typographers and calligraphers of the 20th century, Latin epigraphs and literary quotations. The 624 pages of Western calligraphy are filled with many classical historic scripts, as well as more experimental and contemporary styles. This is the culmination of the art of the letter, bursting with originality and refinement. 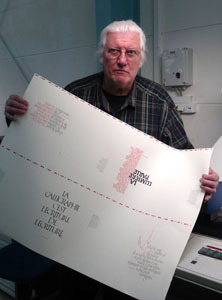 The author has excelled in his mastery of the stroke, of layout and the intricate subtleties of our Western alphabet. 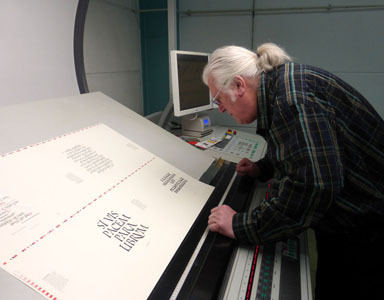 A book, unique of its kind, has never been printed before. 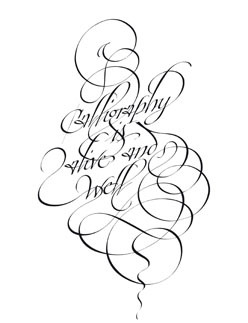 If you are a devotee of real calligraphy, or of lettering in general, this volume deserves a special place on your bookshelf. 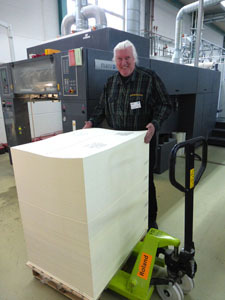 A reference book created, printed, bound and published in Germany. 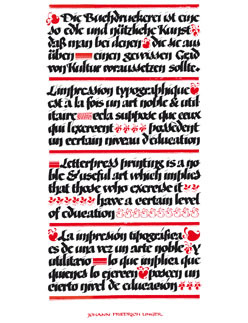 The book: 624 pages, 21 x 30 cm, 300 original calligraphic works, printed in black and red on Natural Line Velin paper, blue lining cover with foil stamping comes with an elegant sturdy slipcase, printed in colour. 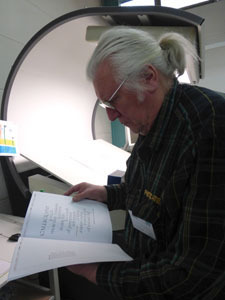 The introduction to the book is written in English, German and French. There is also a biography of the author and a very detailed index. The book is typeset in Optima, a typeface designed by Hermann Zapf in the 1950s, for the Stempel Foundry in Frankfurt, Germany. The set weights 3 kg, including the slipcase. siècle, des citations latines et des citations littéraires. 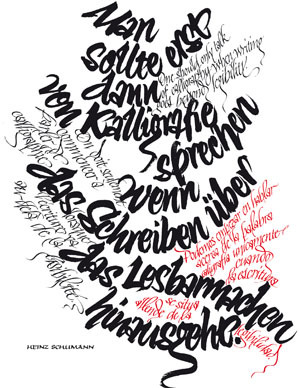 Tout au long des 624 pages la calligraphie occidentale est valorisée au moyen de nombreuses écritures historiques, classiques, expérimentales et contemporaines. 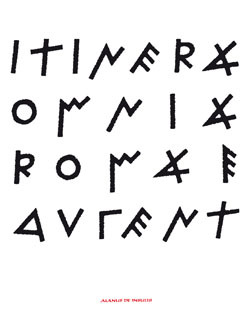 L’art de la lettre culmine, explose d’originalité et de raffinement. L’auteur a excellé dans la maîtrise du trait, la mise en page et les subtilités propre à nos lettres occidentales. Un livre encore jamais publié à ce jour ! 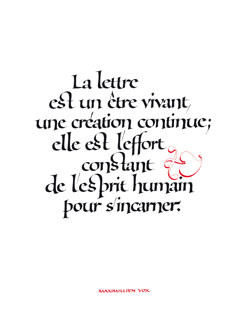 Si vous aimez la vraie calligraphie et la lettre en genérale cet ouvrage mérite une place de choix dans votre bibliothèque. Un livre de référence créé, imprimé, relié et publié, en exclusivité, en Allemagne. 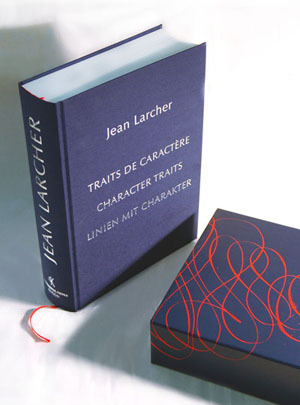 Le livre: 624 pages, format 21 x 30 cm, 300 calligraphies originales, imprimé en noir plus une couleur rouge, impression sur papier Natural Line Velin, couverture toilée bleue avec estampage à la feuille, livré avec un élégant boîtage carton en couleur. Le livre comporte un index très détaillé et une biographie de l’auteur. L’introduction de l’ouvrage est rédigée en anglais, en allemand et en français. 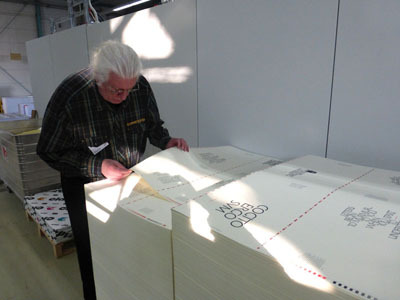 Le livre est typographié en Optima, caractère créé par Hermann Zapf dans les années 50 pour la Fonderie Stempel à Francfort. L’ensemble pèse 3 kg, emboîtage compris. at last printed ! .............................................................................what job !! !